Just when you thought the Bridal show season was over, Elements Event Centre is poised to host the coolest show of the season. Afterhours! 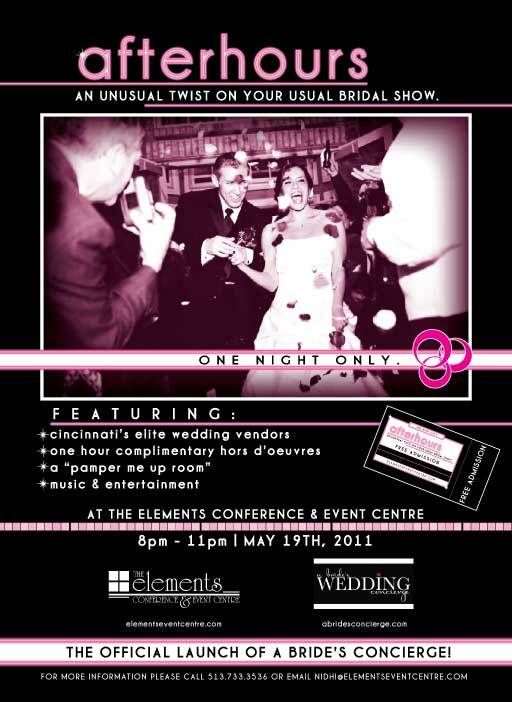 If you have a late 2011 wedding or you are already planning your 2012 nuptials then this show is for you. May 19th 2011 from 8pm -11pm stop in at Elements near rt. 42 and 275 and say hello to Hey! Mr. DJ Entertainment and other wedding vendors. Have a drink in the afterhours vibe and dance and chat up the vendors. Stop by our offices for a meeting between now and then and I’ve got tickets for you. 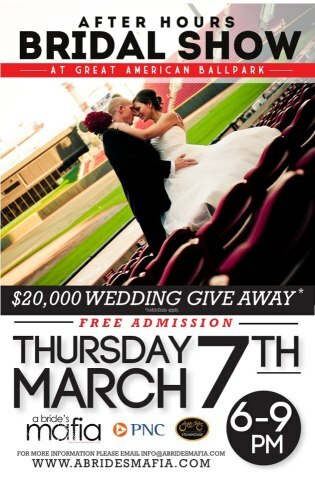 Yes, there are wedding vendors that appear to be a good deal, just like $6 haircuts. Many wedding vendors claim to do the exact same thing as the more expensive service, just like the $6 haircut chain. With a haircut, when you realize it’s bad, you can spend a little more money and go across the street and get it fixed. In the case of a wedding reception there are no do-overs. By the time you realize the DJ isn’t very good, it’s too late. By the time you get your pictures back the event is over. The same can be said for your video. When selecting vendors for your wedding just realize if the price is too good to be true it probably is. Wedding Entertainment is and always will be a talent based industry. That is why we are so proud of the team of people we have on staff. That is why we are so proud of Zach Albers at Hey! Mr. DJ Entertainment. On the biggest day of your life, Zach is a great person to have on your team. When all of your friends and family hear a voice on the microphone for the first time at your reception, that voice should be polished, conversational and fun. Zach is a trained and talented MC with an acting background. He will help set the tone for your event. He will keep it flowing well, while keeping your guests informed. He will convey the importance of the special moments at your reception making your guests feel connected to what is happening. Zach’s main focus is wedding receptions and he might be available for your wedding date. If you place a high priority on the entertainment on your wedding day, then give us a call about Zach today 513-617-5817 .